Image-Line is one of the first companies to make some real progress towards the idea of integrated workflow between mobile and desktop DAWs with the release of their new FL Studio Mobile app. First off let me say that they’ve done a nice job jamming the essence of FL Studio into my iPhone 4. If you know FL Studio you’ll grok it pretty quickly. Scope-wise it’s very close to the notion of NanoStudio. 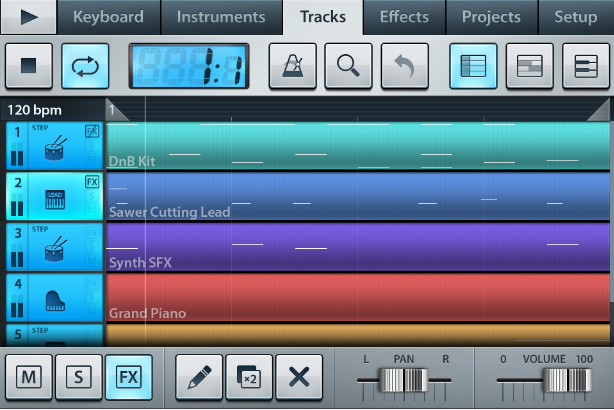 Unlike NanoStudio, the instruments are purely sample-based rather than a mix of samples and synthesis. This ends up being a plus though when it comes to importing your work back into FL Studio as this allows you to work with sonic palettes you are used to without attempting to load instruments that would crush the mobile device’s CPU. Image-Line’s strategy (so far) is to use a smattering of samples from the synths that come with FL Studio including PoiZone, Sawer, Sytrus, Toxic, Morphine, Harmless, DX10, Ogun. 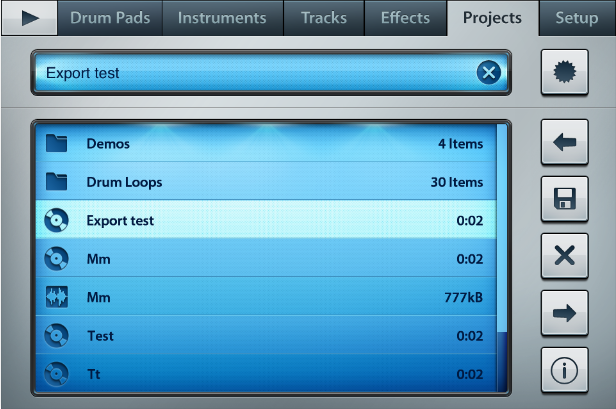 Realistic instrument and drum samples found in FPC are also included. FL Studio Mobile allows you to export .MID, .WAV, and the new .FLM (Fruity Mobile Format). FLM files can be imported into FL Studio Desktop edition provided 1) You register the mobile app 2) you upgrade to FL Studio 10.0.5. I have a link at the end of the post with more details on how to register and upgrade. Once you are up on 10.0.5, you can copy the samples used in the mobile edition to the desktop edition. Importing a .FLM into the desktop edition will create a project and automatically create corresponding tracks and mixer routings. Each track automatically is assigned the proper instrument to load the samples. For example, drum samples may be loaded into an instance of FPC. 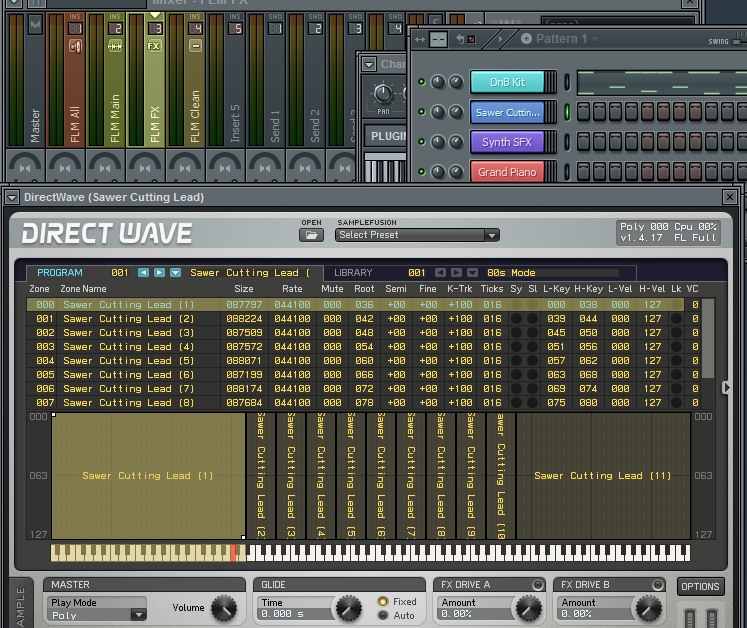 For synth tracks, DirectWave is loaded with appropriate samples automatically loaded into splits and layers. It’s pretty damn cool! I’ve taken time to document the process. Below you can see a screenshot from my iPhone of a little track I started working on. Note track 2 is using samples from Sawer Cutting Lead. From the projects tab I save “Export test” as a project. Next I connect my phone my Windows sytem using the USB cable and fire up iTunes, click on the phone, then Apps, then scroll down and select FL Studio. I then select “Export test.flm” and click “Save to…” and save to my hard drive. Then I open FL Studio and open “Export test.flm” and – bam – the set loads (click the screenshot below to see the image full-sized). In my case the set sounds almost identical although I’ve read on Image-Line’s forum there might be times when things don’t sound 100% the same – still – fantastic! Hats off to Image-Line for taking mobile workflow to the next level. It would be interesting to see if they could further enhance this concept by offering a second form of import. One where samples would still be used on the mobile-side but meta-data would be added to the .FLM such that the desktop edition could load the actual corresponding plugin and patch. Also the ability to load your own samples and synch would be fantastic as well. Also, in addition to syncing through iTunes it would be great to sync .flm files through the cloud – like through dropbox. This is a great effort by Image-Line and I’m hoping companies like Ableton are watching. I’d love to see an .als could sync system with a mobile variant of Live. It seems to me Ableton could port Simpler and Impulse and have full native device bi-directional synch with mobile devices since these instruments are already sample-base. I'm already using FL Studio a little more as a result of using Mobile. Now that Image-Line has upped the ante, DAW makers are going to be forced to create mobile variants just to ensure entanglement with their desktop versions. Article on how to register mobile and download 10.0.5.